Henry helping me cook at the cabin! We so enjoyed our stay!💕. We would drink our coffee on the kitchen porch every morning and eat our fruit and cheese with wine in the late evenings out there with little blankets. The afternoons were spent getting to know downtown Asheville. We loved the French restaurant called Isa’s and sat outside watching the people pass by as we nibbled on small appetizers. At the little children’s shop across the street I found the sweetest things for my two littlest grandchildren. We rode the trolley and heard all the history and funny stories the driver told. We were even lucky to see a mama bear and her cubs while riding. The driver pulled over so people could take pictures, but made us promise we wouldn’t get off the trolley. We are going back to The Grove Park Inn for an early lunch because we heard some of the other tourist talking about how good it was. 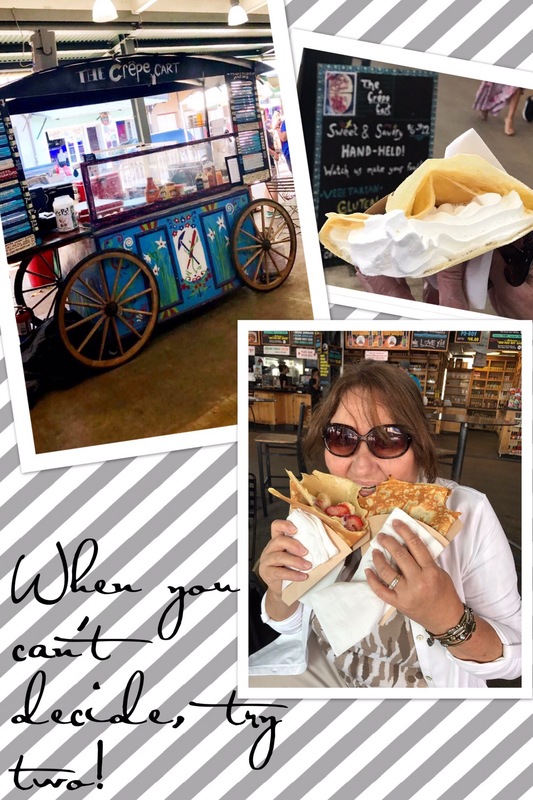 We tried and enjoyed the crepes at the Twisted Crepe. I make crepes and like to find new recipes for them. We missed the crepes at Isa’s because they only serve them on Sunday for brunch. Oh well, next time! We walked all over the city up and down the streets over rough bricked areas eating our chocolate candy rounds. So many chocolate stores if you ran out you could just pop into another one for more. Bought a children’s book at the book store called “Goodnight Asheville” to read to my grand babies. We had coffee at the fancy McDonald’s in the Biltmore Village area because I saw that on TV years ago and heard they had a fireplace inside. ( They do!) 😘. Goodnight Asheville until next time!